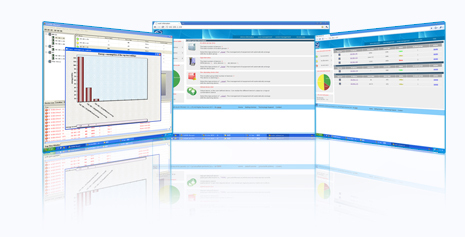 CLEVER Manager is the advanced data tracking and system software monitoring system developed by CLEVER. This system protects the data center environment and improves energy efficiency. It is easy to use and extend with reliable and well-calibrated functions. This software allows you to quickly and analytically understand the operating state and the data center environment. CLEVER Manager is a well-designed integrated solution that is widely applied to data center firefighting, refrigeration, security and fire protection systems. CLEVER Manager can quickly monitor the state of the distribution and power system environment in the data center, such as power distribution, UPS parameters, UPS operation, and so on, ensuring data devices are uninterrupted, secure, and stable . 2. Monitoring the cabinet micro environment. CLEVER Manager is able to quickly monitor not only the electronic input voltage, load current and power consumption parameters, but also the temperature, humidity, door, smoke and water recording status ‘wardrobe. 3. Monitoring the air conditioning system. CLEVER Manager is able to quickly monitor the operation status, temperature, humidity, and air conditioning switching precision in the data center. CLEVER Manager can control security and video surveillance in a timely manner. CLEVER Manager can control fire protection, equipment, alarm and alarm alarms in a timely fashion. CLEVER Manager is able to quickly collect power, voltage, power and power data data from intelligent data devices and PDUs (NPM, EMS, SI-PDU, PDU measured, switched PDU, MS -PDU) Manager for PUE Analysis. CLEVER Manager can quickly track over 1000 power distribution and environmental protection devices across the network, cascade connection, and serial communication. CLEVER Manager can provide a custom technology service, based on the detailed requirements of the data center manager.